The Sustainable Sites Initiative (SITES) seeks to promote the importance of sustainable landscapes by encouraging owners, designers, and contractors to submit their projects for the nation’s first green design recognition for landscapes and site design. Promoting sustainability through guidelines and benchmarks, SITES helps direct applicants toward relevant resources and best practices, and rewards their efforts with certification. The requirements for certification, however, noticeably favor projects with private financing over public funding and unduly constrain ultra-urban projects. During preparation of the SITES documentation for our Hunts Point Landing project, Mathews Nielsen identified three categories of credits that limit certain types of projects from achieving a three- or four-star certification. The first pertains to a site’s designation as an urban brownfield, which has inherent constraints particularly with regard to soils, water, and existing vegetation. The second category inhibits projects that are publicly funded which, due to stringent obligations arising from government policies, do not permit the use of proprietary products, mandated construction methods, or post-construction activities. The third factor applies to overly prescriptive program requirements that may not be appropriate for all contexts. Of the fifteen certified projects to date, Hunts Point Landing is the only publicly funded project to achieve a 2-star rating. The three projects that have achieved a 3-star rating were privately funded. Thus far, only two certified projects are urban brownfield sites. The U.S. Department of Housing and Urban Development notes that there are “as many as 425,000 brownfields throughout the U.S. Some estimates show that there are 5 million acres of abandoned industrial sites in our nation’s cities.” These are the types of sites in need of repurposing for public benefit. Given their degraded condition, they also stand to gain the most from sustainable design, yet face big hurdles in receiving a multi-star SITES certification. Admittedly, a significant number of points can be garnered through the selection of an urban site. A project easily amasses points for redeveloping an infill, greyfield, or brownfield site, especially if it is accessible by public transportation. However, unattainable points quickly add up, for example, when there is no threat of a wildfire (credit 4.13–3 points), which is atypical of an urban condition. Similarly, the benchmark for reducing light pollution may conflict with local requirements that set minimum illumination levels to ensure security for public users (credit 6.9–2 points). Also, degraded post-industrial sites, especially brownfields, will likely have few cultural or historic resources worthy of preservation (credit 6.4), yet a maximum of 4 points are assigned to this credit. Together, these three very specific credits total almost 4 percent of the available points. 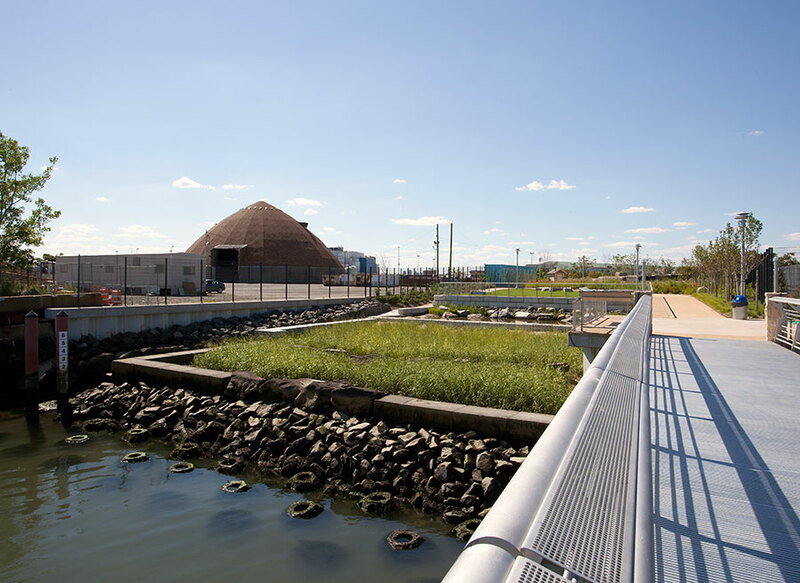 Hunts Point Landing was formerly a dead-end roadway, completely surfaced in concrete and asphalt. Logically, removing pavement, containing contaminated site soils, and providing a public park were significant improvements over the pre-existing condition. But, by not having on-site vegetation, structures or amenities to retain or salvage the number of achievable points is reduced. Another 4 points are precluded under credit 5.2, which calls for maintaining on-site structures, hardscape and landscape amenities. Removing pavement to replace it with landscape was, curiously, a detriment to our certification level yet results in quantifiable improvement for water infiltration, habitat creation, air quality, and urban heat island reduction. Hunts Points Landing’s design was completed prior to its selection for the pilot project, and while points were achieved retroactive to our planning and design phases it surprised us how efforts to substantively improve the site condition were disadvantageous to the certification process. We suggest that further refinement be made to the credit descriptions to account for a more diverse range of conditions where at least 27 points, 11 percent of the total points available, are too specific for projects within a highly urban context. Thus far, four of the 15 certified projects were funded solely by public money, with an additional three projects constructed as private/ public partnerships. No project that relied fully or partially on public funding was awarded a three-star rating. While SITES promulgates the importance of an “integrated design team,” there is no acknowledgement of the contractual and procurement limitations embedded in publicly funded projects. Constraints related to public financing stem from ‘chain of command’ clauses that define owner-designer-contractor relationships during construction and mandate selection of the ‘lowest responsible bidder.’ Credit benchmarks need to be reconsidered in instances where the owner or designer must dictate ‘means and methods’ to a contractor. Limiting greenhouse gas emissions during construction (credit 7.6–3 points) cannot be assured through a competitive bid process where a designer or public owner cannot unduly restrict construction equipment choices required to meet SITES levels. Credit documentation (credit 6.1) relates to a contractor’s commitment to a living wage and requires that the applicant have access to the contractor’s payroll, which violates the designer-owner public contract. Community benefits agreements (credit 6.1 and 6.2–combined 7 possible points) are far more applicable to a private developer project than one in the public realm. Similarly, public funding is earmarked for permanent (capital) improvements and cannot be applied to maintenance or monitoring. Projects constructed on public land typically remain under public control and as a result have a procedure for ensuring maintenance through a parallel public entity. This intra-governmental relationship does not dictate the need for a site-specific stewardship agreement because maintenance of public land (park, street or otherwise) is integral to the operations of respective public agencies. However, lack of a maintenance agreement hinders a project’s ability to achieve points related to multiple credits in Section 8–Operations and Maintenance. In addition, the monitoring submittal documentation (Credit 9.1-10 points) requires the designer or owner to engage a “third-party” to perform post-construction testing and reports. Engaging post-construction services does not comport with the rules of public capital financing. A designer’s fees for construction administration are due upon completion of construction and cannot extend to cover activities beyond the contractual definition of “final completion” of a project. Other credits out of reach to most publicly funded projects pertain to those that can only be assured by specifying a sole supplier or proprietary materials. This is specifically prohibited under public procurement guidelines because it undermines the low bid process by mandating named manufacturers or products. The SITES credits that are most impacted are contained in the Section 5–Site Design–Materials Selection. For example, Credit 5.4 (2-4 points) calls for the reuse of salvaged materials and plants. Specifying these materials without naming a suitable source through performance language would be arduous. Furthermore, the submittal documents require access to the contractor’s post-bid invoices, which are not available to either the owner or designer under public procurement contracts. Similarly, credit 5.5 (2-4 points) has benchmarks for percentages of recycled content in furnished materials; this confines the designer to specifying a very limited number of manufacturers capable of meeting the currently high standard, not infrequently resulting in an increase in cost of the material. This combination of limitations is another strike against public projects where the lowest responsible bidder is awarded the project. The referenced credits impacted by public funding issues total approximately 56 possible points; 22 percent of the available points. A series of the SITES credits are specific to project programming which are required to be universally applied to all projects seeking certification in order to maximize the achievable rating. Omission of these features, where they are deemed not suitable, affordable or imperative to the end-user, results in a loss of points. Credits 4.10 and 4.11 assume an occupied building and offer up to ten points for the use of vegetation to minimize heating and cooling requirements. Similarly, credit 3.8, worth up to four points, calls for the sustainable operation of water features, and is applicable only “to sites with created water features.” Due to the cost to design, build, and operate a water feature, it could be argued that they are not part of typical programming for landscape projects and therefore result in a four-point deficit. Furthermore, a series of credits in Section 3 Site Design–Water, call for the protection, restoration, and rehabilitation of streams, wetlands, and shorelines (credits 3.3 and 3.4) valued at a total of thirteen possible points. Few projects will be able to pursue these credits if they do not have waterfronts or wetlands within the project limit. Additionally, due to high demand, the availability of FSC-certified woods is extremely limited, which led our firm to not specify any wood for Hunts Point Landing, resulting in a loss of 4 points per credit 5.6. These types of credits can be a boon to projects with a broad programmatic range, but eliminate large amounts of points from the achievable pool for projects with limited scope, size, or geographic isolation from waterways. These formulaic program requirements account for 31 points totaling over 12 percent of the available points that can be used toward certification. The efforts undertaken by Mathews Nielsen and the project team as part of the certification process unquestionably improved the long-term sustainability of Hunts Point Landing. While the project was bid prior to the start of the SITES Pilot Program, the design team was able to work with the client and contractor to maximize our attainable points within the contractual and funding constraints identified therein. The inclusion of innovation credits was a benefit as it allowed us to highlight some of the project’s unique characteristics and design solutions while boosting the final point total to a two-star certification level. As discussed above, however, at least 100 points are potentially out of reach to a publicly funded, urban site denying them of achieving three-star rating, unless they successfully attain every possible point for every applicable credit. With the SITES program in its infancy, there is great potential for this certification process to maximize its value to the field of landscape architecture and to provide a smart design framework for future projects. We encourage the SITES authors to make this hallmark program more inclusive of conditions to maximize its broad benefits.